Why the negative approach? Advertising doesn’t trick people. It informs people about products and persuades them to buy. Out here in flyover country, we call that capitalism. The “Food Advertising Tricks” page rails against “food stylists” who make sure the food looks representative even though it’s left under studio lights for hours during a shoot. Once people learn how food stylists work, promises PBS, you just might lose your appetite. If PBS is going to take shots at food stylists for making food look good during photo shoots, maybe their on-air personalities should forego make-up when appearing on camera. Yech. Talk about losing your appetite. To prove bargain brands are just as good as designer brand clothes, PBS has kids pick from two pictures, one with a child model in bargain clothes and the other with the same model in designer clothes. Apparently PBS isn’t above a little photographic trickery itself. The bargain priced clothes always appear better than the comparable designer clothes. The models even pose better when wearing the bargain clothes. Look, I understand that kids are susceptible to ad messages. That’s why parents shouldn’t give kids their own debit cards. And I don't really care whether anyone buys designer clothes or not. I’m not exactly known for designer clothes, unless you consider Wranglers a designer brand. I do admit to wearing ballcaps with logos. Wait. I thought the site was about honesty in advertising, not advocacy about video game violence. Who’s tricking who? For cereal box designs, PBS says, “The superhero is a great choice because little kids prefer fantasy characters to pictures of real people.” Hmm, isn’t this the way PBS programming for kids works (e.g., Sesame Street)? Presumably, the use of a cartoon character in packaging is bad (though parents might appreciate a cartoon image that helps encourage their child to eat the cereal the parents select). I guess cartoons characters are okay when PBS uses them to encourage kids to reject capitalism (see the image at the top). There’s nothing wrong with showing kids how marketers persuade. There’s not anything wrong with a private business, group, organization, foundation, or individual painting business in general and advertising in specific as evil if it’s done with private funds. I personally don’t like it, but there’s nothing wrong with it. There is something wrong about a government funded entity teaching children that business is out to trick people and that business is the enemy. Even worse, the site is designed to be a resource for teachers, so children can be fed anti-capitalist propoganda while they are captive audiences. What’s the difference between a 15 second television ad and a 15 second sponsor credit? The former is honest advertising. The latter is PBS trickery. Even marketing to kids is okay when it helps support PBS [PDF]. Again, who’s tricking who? The easiest way to boost your company's profitability is to increase add-on sales during service calls. For a profitable company, the gross profit from an add-on sale magically falls straight to the bottom line. Read the rest in a column I wrote for Contractor Magazine. For an audio version of the major posts, be sure to check out The Comanche Marketing Podcast. Furthermore, obituary readers are older, better educated, and more likely to be female than the average newspaper reader. In other words, they’re read by your target customers. Many large metropolitan newspapers contain neighborhood sections that are only published in certain towns or sections of town. Consumers receiving these sections perceive the businesses who advertise in their suburban section are specialists in their market. The neighborhood sections are often published on certain days of the week, increasing the readership within their target market. Yet, because the circulation is less, the cost of advertising is less too. People read newspaper police blotters or scandal sheets for the same reason they rubberneck. The read them for the same reason they watch the early knock out rounds of American Idol. There’s just something about a train wreck, about gossip, about the misfortunes of others that causes us to want to look and leer. Of course, few will admit to a steady readership of the police blotter in their local paper, though it’s often highly read, especially in small towns. Consider placing small ads on the same page as the blotter. A local celebrity is anyone well known within your community, but little known outside it. Local celebrities could include high school coaches, professional athletes who reside in the area, radio deejays and personalities, local television newscasters, local politicians, and well-known and respected local businesspeople. Celebrity endorsements are somewhat controversial in marketing. Brand Week reported a study where affluent people were not influenced by celebrity endorsements. Of course, the affluent in the study were really affluent. Their average income was $400,000 and their net worth was $2.7 million. The marketing consulting firm, Interbrand, defines brand value as the potential for future earnings. According to Interbrand, Nike’s brand value is on the rise. In 2003, the firm found the Nike brand to be the 33rd most valuable in the world. Nike built its brand using the likeness of athletes like Michael Jordan and Tiger Woods. Some of the world’s most sophisticated marketers continue to feature celebrities, which suggests something must be working. Moreover, national celebrity endorsements are not the same as local endorsements. In most markets, local celebrities seem more real than Hollywood types or national sports figures. Before you use a celebrity, you should define your target market. Is the celebrity known to this market? Is the celebrity interesting to the market? When the discount Internet travel agency, Priceline, first launched the company targeted the Internet savvy. In the late 1990s, this meant geeks. Who better to serve as pitchman to geeks than Captain Kirk? Priceline selected William Shatner as spokesperson in mid-1998 when the company sold 1,500 tickets per week. By the end of 1999, Priceline was selling 50,000 tickets per week and accounted for 2% of leisure airline ticket sales. The next requirement is that the celebrity is credible with your product. Tiger Woods is gold on the golf course, but would he be credible as a spokesman for dog food? Even if Tiger loves dogs, it’s hard to see how he would oversee their care when most of his life is spent on tour. For the most part, home services providers have an easy time creating credibility. After all, everyone needs their air conditioning serviced, plumbing work from time to time, lawn care, carpet care, and so on. Place your products or donate your services with a local celebrity so they can speak about your company with true credibility. You don’t want to hire, say, Jessica Simpson to endorse your topical acne medicine stating, “I just had so much build up and so many clogged pores that once I started using Proactiv Solution, my face was just shining,” only to discover that she gave the credit to the prescription medicine Accutane in earlier interviews. Oops. If the celebrity never used your product, don’t ask him to say he did. Instead, use him as a spokesman. Finally, make sure the celebrity has positives that can transfer to your brand. You are using a celebrity because he is more recognized in your market than your brand and has the type of image you want to associate with your brand. I doubt anyone would want Michael Jackson associated with their brand for example. So your company has never been named the national contractor of the year (or whatever’s the equivalent for your industry). Do you know they guy who has won the award? Maybe he would endorse you? The contractor of the year simply says something like, “If I lived in Dallas and needed my carpets cleaned, I’d call my friends at Carpets R Us.” Below his picture you give the name, company, city, and award. Some of the most powerful ads use a real customer talking about your company. This is a testimonial in print or broadcast. And real people are, well, real. Encourage people to talk about how easy the repair, purchase, or installation process was. Instead of talking about money they saved, encourage them to talk about what they did with the money they saved. Home Depot had been an established force in the area where I live when Lowe’s moved in. When Lowe’s opened a new store, their market analysis seemed limited to finding where Home Depots were locating and opening across the street or as close to their competitor as possible. It made sense. Consumers already knew where the closest Home Depot was located. They were “trained” to visit the area. Lowe’s was piggybacking on previous Home Depot marketing. Then, Lowe’s went after Home Depot’s weakness. Home Depot is designed for men, while women are responsible for 80% of home improvement purchases. So Lowe’s brightened their stores, widened the aisles, and added designer brands like Laura Ashley. Lowe’s emphasized what Home Depot did not and has generally out performed the Atlanta chain since. Lowe’s approach can work for you. If there is a section of the newspaper where companies from your industry congregate, advertise there. Study the competition’s ads and stress items of importance to homeowners that your competitors do not. For example, an air conditioning contractor whose competitors stress products might zero in on guarantees, offering an unconditional money back guarantee. Or, the company could stress financing, switching to 10 year term financing if the competition is limited to a manufacturer revolving plan. Find or create a point of superiority. There’s a bonus for piggybacking on the competition’s ad. If your competitors are using large ads, they’re spending the money to grab the attention of homeowners interested in your products and services. You can use a smaller, more targeted ad focusing on your points of superiority. D-R-A-I-N-D-R matches the company’s main phone number, 372-4637. Why not make a jingle out of your phone number? “Four out of five dentists recommend sugarless gum for their patients who chew gum,” claims the Trident ad. Lincoln Technical Institute quotes U.S. Department of Labor projections about the shortage of air conditioning technicians in recruiting ads. Both companies are using third party statistics to build credibility. You can too. People are naturally cynical about advertising. Any claim you make will be greeted with skepticism. This is why you use a third party. The Internet makes it incredibly easy to find statistics supporting your claims. However, it also makes it incredibly easy for people to fact check your claims. Make sure you’ve can source your claims. In a large market broadcast television may be unaffordable. Cable is not. In some areas, cable advertising starts at $2 for a 30 second spot. Even in larger cities, cable may only cost $10 to $25 per spot. That’s within your reach. Moreover, cable presents opportunities to target. Often, you can zero in on particular suburbs, allowing you to limit your advertising to your service territory. Targeting exceeds geography. With cable you can select shows with audiences that closely match your target demographics. Want to reach women? Try Lifetime or Oxygen. Looking for families with children? Try Discovery, Disney, ABC Family, and so on. Cable lets you focus your advertising and costs less to boot. In 1998 for Superbowl XXXII, Fed Ex ran an ad that consisted of 30 seconds of silence. On screen was a test pattern and a scrolling message, claiming that the real ad wasn’t delivered because the ad agency didn’t send it using Fed Ex. It was a gutsy move that paid off. The absence of sound practically compelled people to look, to pay attention. It’s a primitive reaction to a change in our immediate environment. Something unexpected happened. What’s up? Is it a risk? Fight or flight? We’re compelled to find out. Try it some time. Use silence. A digital video recorder is one of those devices I never needed… until I got one. Now I can’t live without it. The same thing is true for millions, with more converts every day. And what do the viewers do when watching a recorded show? Fast forward, of course. Fast forward right past your ad. About all you can do, short of abandoning TV altogether is to make sure your logo and/or website are visible, even if the viewer fast forwards. If you make the logo visible in a stationary position for at least 15 seconds of a 30 second spot, you’ll at least get impressions. Since the viewer is focusing on the broadcast while fast forwarding so he doesn’t fast forward too far, you’ll get a stronger impression than someone watching live and zoning out or hitting the fridge during a commercial break. These are just variations and some of them are only slight variations. Have you got any to add? Email them to me. Tommy Tutone rose to number four on the charts with “Jenny/867-5309.” It’s a good song. Of course, for people with 867-5309 as their phone number, it’s been an irritant. Many reported daily prank calls for years. The number’s worked well for Gem. Anthony Gemma, one of four brothers who owns Gem, claims over 20% of the consumers in their market area know their phone number by heart. In 2004, they filed a trademark for the number, which was granted in 2005. It’s a good story about the power of music in marketing, branding numbers, etc. But then, trouble brewed. According to Gem’s blog, a national plumbing company learned about Gem’s use of the number in its marketing, during acquisition talks. Builder Online reports that the competitor began using a toll free version of the number in 2006. The competitor also licensed the Tommy Tutone song from Warner Chapel Music. The story's making national news. Anthony Gemma’s was even interviewed on NPR. Listen to the interview. Can Business Be Too Good? The Service Roundtable offices in Grapevine, Texas. Bordering the northern edge of DFW Airport, Grapevine is the junction for a number of major highways. It's accessible to nearly everyone in the Dallas/Fort Worth metroplex. Not only does the town have a great location, but it has a certain degree of cache. Grapevine has a quaint downtown with lots of galleries, restaurants, and wine tasting rooms. The area is growing. The real estate market is soaring. Demand is on the rise. Several months ago, we began a quest to search out new office space. We've called about lease space. We've considered buying property. It's been frustrating. if it has a website at all. Most do not (at least, the sites aren't listed on the "For Lease" or "For Sale" signs). A. You sell for a living (even if you don't, pretend you do). C. You return the call. That's the way it works in a sane world. The commercial real estate market in Grapevine is not sane. A friend from Cleveland was riding with me while I took a look at some property. We drove by a small office with a "For Lease" sign out front. I immediately called. Surprisingly, someone answered. The available space wasn't large enough. I told this to the person on the phone. I waited two beats, thanked the person, and hung up. Turning to my friend I asked, if he noticed anything unusual. "Yeah," he said. "She didn't try to find out how much space you needed or offer any other offices to you." Bingo. It was the classic response of an order taker, not a salesperson. Grapevine's commercial real estate market is too good. The salespeople don't have to sell. Apparently they don't even have to answer the phone or return calls. I still don't know how some of them make a living. The problem with hot markets is they eventually cool off. When that happens, the order takers will be in trouble. The real salespeople will eat their lunch and drive them into other occupations. Real salespeople hustle in a good market and shift into another gear when things cool off. They recognize soft markets are opportunities to drive out the competition, secure more share, and position themselves for a great ride when the market turns. Good markets are like the high tide, carrying everyone over the shoals. In a soft market the tide lowers, the rocks appear, and the salespeople who know how to steer around the rocks will still do well. The order takers will crash. Can business be too good? Never. Yet, a weak market every now and then will help clean out the order takers. I mostly grew up in the Northern Florida, which means I grew up eating something called "boiled peanuts." I was seven or eight before I realized they were boiled. We called them "bawld peanuts." Boiled peanuts are green peanuts boiled in salt water for hours. The salt seeps in through the shell and gives the peanut an unusual flavor. If you grew up eating boiled peanuts you know how good they are. Boiled peanuts are one of the most addictive foods I know. Once you start eating them, it's hard to stop before you run out. Boiled peanuts are pervasive in the deep south. They're available at roadside stands. Bags are available on the counters of convenience stores. When I was growing up, kids used to hawk them through the corridors of the state capitol. A lot of the roadside stands promote the fact they've got "hot" boiled peanuts. Personally, I like them refrigerated. 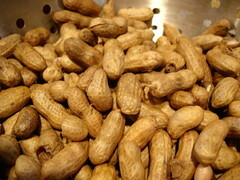 A recent innovation is the Cajun boiled peanut. This is a spicy variation featuring crab boil, cayenne pepper, or other spices in the water. I like them, but prefer regular boiled peanuts. Boiled peanuts have never spread beyond deep south. We don't get them in Texas. We can't even get the green peanuts necessary to boil our own. My kids grew up eating boiled peanuts on annual vacations to the Florida Panhandle. After watching everyone devour them, my wife finally tried a few and found she liked them, though she never appeared to have the appreciation of someone who grew up eating them. This summer, we returned to Tallahassee for my neice's wedding. Boxed between high school graduation, soccer, and choir tours, we raced in for the wedding, spent a day at the beach, and raced home. My kids were upset that we didn't take the time to buy green peanuts before leaving the beach. I promised them I would try and order some over the Internet to quiet them, but didn't really expect to find WeShipGreenPeanuts.com or something like that. To my surprise, it was relatively easy, if not cheap to order green peanuts (you gotta love the Internet). When the arrived, I boiled a bunch. I took some to work and some to church. My daughters invited friends over to try them. If you're wondering when I'm getting to the point, this is it. Almost no one took one look and wanted to give them a try. It took encouragement and persuasion. After all, they're wetish. They're a blue/purple color. If you didn't know they were a delight for the palate, you might hesitate. My daughters are pretty persuasive. They persuaded most of their friends to try them. Once they did, most discovered they liked them. The adults I shared the peanuts with were less likely to give them a try, maybe because I didn't push as hard and my offspring. They didn't like the look and apparently didn't trust me. Gee, don't I look honest? I was amazed to discover that around half the people who tentatively agreed to give boiled peanuts a try didn't have the first idea how to open a peanut. Instead of splitting it along the seam, they snapped the peanut in half. Huh? There are people who never opened a peanut? Even a roasted peanut? 1. People hate the unfamiliar and are naturally shy away from the unknown. If you product is truly new to people, you've got an uphill battle. 2. People will act on the advice of those they trust, if the recommendation is strong enough. 3. Evangelists for your product or service are much more effective getting people to engage in trial than you are about your own products. After all, they're more trustworthy. 4. Ultimately, evangelists are created by excellent products and services. If boiled peanuts weren't so good, my kids wouldn't twist their friends' arms to try them. 5. People do judge books by their covers, products by their packaging, and food by its appearance. The better your packaging, the better you can make your products appear, the more trial you will win. 6. People need to be trained how to use your product. Just because something seems obvious to you, doesn't mean it's obvious to your customers. I thought opening a peanut was obvious. I saw a great recruiting sign on the back of a cab in Houston yesterday. The headline proclaimed, "Looking for an office with a view?" The remaining verbiage was about the joy of cab driving, with a number to call. The sign made driving a cab sound more like a vacation than a job. Dominick Guarino from the National Comfort Institute stopped by the Service Roundtable World Headquarters today. I mentioned it to him. He said he's been advocating technician recruiting ads that describe the requirements, emphasize the duties, build up the training, and stress the benefits without mentioning the industry. Mike Hajduk from Callahan Roach Business Solutions also dropped by. He mentioned that John Garofalo (at least, I think it was John) used to take his car to a different lube shop whenever he needed an oil change. He would look around and see who was really hustling and seemed to have a great attitude. He would ask these guys if they would like more freedom and better pay. With the door open, John gave the guy a business card and suggested he give him a call. With a shortage of labor, marketing should not be limited to recruiting customers. Use to recruit employees! I'll never forget my first Gen X employee. During a minor crisis, I asked him to work late. He said, "No." “Uh, what did you say?” I asked. Apparently he had other things to do and work just wasn’t that important. As an aging, appreciating (well, per the bathroom scale I'm appreciating), WASP, I have a tough time with Gen X. I couldn't understand the programmer who turned down a healthy incentive to work over a weekend when we were trying to launch a new product. He wanted to work on his deck. We were paying him enough to hire someone else to build the deck and come out ahead. Didn't matter. He wanted to build a deck. If Gen X wasn’t enough, now we've got Gen Y. Here Comes Gen Y The Hell Should I? Sorry you have had to do so much chasing. Still I guess the reason for this is a Serviceroundtable success story. Since subscribing to Service Roundtable and taking full advantage of all its wonderful help, advice and services, the value of my business increased to such an extent that on May 1st it was purchased on the very best of terms. Since then I have been touring Europe and am about to leave on a cruise of Alaska. I am indebted to Service Roundtable and have strongly recommended the service to the new owner and also to each and every contact I come across in the industry. I will no longer be subscribing (though if I can be a reference any time; you only need ask). I hope that you will be asked to continue membership for [my old company]. If you're in plumbing or HVAC, visit The Service Roundtable to learn more. When you’re in the home, place stickers everywhere you can. Make it easier to find your number on a sticker than in the yellow pages. Electricians should sticker the breaker box. Air conditioning contractors should sticker the furnace and disconnect. Plumbers should sticker water heaters and disposals. Landscapers should sticker the sprinkler control box. Everyone should consider placing stickers on the inside of the cabinet door under the kitchen sink. Recently, we were looking for the name and phone number of our t-shirt vendor. Janet Thomasson, the Service Roundtable’s Chief of Staff, was telecommuting. I called her for the information and while she couldn’t remember the name off the top of her head, she did know how to find it. “Look for a magnet on the freezer door in the office,” she said. Some of the most valuable real estate in the customer’s home is the refrigerator. It’s at the center of the home and is one of the most visited appliances. The refrigerator is usually a family bulletin board with notes, lists, drawings, awards, and pictures all held in place by magnets. Make sure your magnet is one of them. Make sure your number is available at kitchen central. For a complementary, illustrated, digital book featuring dozens of innovative ways to use refrigerator magnets, contact Liz Patrick by email at liz@serviceroundtable.com. Valve tags are used in industrial operations to help identify piping circuitry. Legendary plumbing contractor, Frank Blau, took the concept and added a marketing spin. Frank created residential valve tags to use for marketing purposes as well as informational. The tags provide useful information to homeowners as well as full company contact information. Valve tags aren’t limited to pipes and valves. They can be used for electrical products, control products, and so on where you can use a tie to attach a tag. You can easily make your own using a luggage tag or ID badge lamination kit from any office supply store. Design the cards you laminate to include full company contact information and punch outs for to identify the valve or pipe for plumbing, voltage or circuit for electrical, and so on. Air conditioning contractors in colder climates can provide winter condensing unit covers with the company’s logo as a benefit for service agreement customers (and the service agreement helps cover the cost). Plumbing contractors can offer water heater blankets with the company logo. Pool contractors can offer covers for pumps and filters. Walk around your own kitchen and count the visible brands. In my kitchen, manufacturer brands are visible on the faucet, sink ring, dishwasher, refrigerator, microwaves, oven, stove, vent hood, coffee maker, can opener, toaster oven, cutlery, phone, answering machine, and soap dispenser. With the exception of the soap dispenser, I can’t find the brand of the store that sold the products or the contractors who installed them. If people are willing to accept everyone else’s brand in their home, why not place yours? Few things are as personal to people as cars, yet car dealers show no hesitation sticking their logo on the back of the cars they sell. Co brand by including your logo and website or phone number on the products you sell. Air conditioning contractors can get their logo and phone number tastefully silk screened on thermostats and supply registers. Plumbers can replace sink rings with one’s that carry their company website and phone number when they replace disposals. Anyone can order domed case decals like off-brand computer assemblers use or plastic or chrome trunk decals like the car dealers use. These can be attached to furnaces, breaker boxes, control boxes, condensing units, water heaters, pool equipment, and more. Raised plastic or chrome trunk decals have the advantage of permanence. Your competitors cannot use a sticker to cover up your logo. copies in a file, available for review by future technicians. The report does provide useful information to future technicians. It builds the value of the service you provide. It also provides another place outside of the yellow pages where your company contact information can be found. Provide a clear plastic envelope to hold the reports that can be attached with double stick tape to a product, such as a water heater, furnace cabinet, and so on. The idea is to make the reports readily accessible by the technician and the homeowner. There’s already an entire generation of consumers who will not use the yellow pages, period. They never even consider it. They’re web oriented. If they cannot find you quickly on the Internet, they’ll call the company they can find. Make sure you’ve got a website that uses your company name. Use Google Ad Words and other search tools so that your name pops up when someone searches for your product or service words in your target zip codes. After everything you’ve done, someone might still find their way to the yellow pages. If you can’t keep them away from the yellow pages, try and keep them from opening the book. At the end of a call, give the customers a yellow pages discount sticker. When the customer shows a technician a yellow pages directory with the sticker on the cover, the customer saves an extra five or ten dollars. An alternative to the yellow pages sticker is a business card sized discount card that can be inserted at the start of your trade listing in the directory. The card works on the same principle as the sticker. I’ve been taking you through an explanation of how to get a public relations program up and running. Over time, this can be more powerful for you than conventional advertising. PR is gold. It’s more credible than advertising. It builds mindshare. A key element in any public relations campaign is a press kit. It takes less effort to put one together than you might think. Plus, much of the content in a press kit can be repurposed. You can use the copy in your marketing. Tell someone you’ve got a “press kit,” and it sounds impressive. But putting one together seems intimidating. It’s not. A press kit is a simple a collection of background information about your company that you give to media people. It’s designed to make their jobs easier. It’s designed for a sound bite world. Remember, the media reads in bullets, so give the media information in bullet form. Assemble the different pieces of your media kit loose leaf in a folder. Voila, you’ve got a press kit! Bind them and you’ve got a company brochure. Here are the separate elements you should consider including in your press kit. Could you be an expert for Channel 4 or the Daily News? Sure. You know more about your business and industry than anyone at the news station or paper. You know more about upcoming industry changes and how they might affect consumers. You know what’s going to make an impact even before the media does because the consumer media are generalists. Generalists depend on specialists. That’s you! Headline a page with “Areas of Expertise.” List the different areas in bold with bullet points describing the area/issues and your unique ability. A swimming pool contractor is an expert in pool maintenance, how to achieve a good chemical balance, and resurfacing. The contractor can cite certifications, the number of pools he resurfaces, and so on to build his credibility. A plumbing contractor could address water purification. Or slab leaks. Or tankless water heaters. Changing technology and regulations are opportune areas to show expertise. Air conditioning contractors should contact local media now about the upcoming change in refrigerant mandated by the government. Every business owner is a de facto expert in selecting a quality company in their field. Every owner is an expert in new technologies and trends. The new technologies may not even be new, as long as they’re new to the media and most of the public. Search Google News for your industry. What are people writing about? What’s hot? If you or any of your employees write articles for a local newspaper, local trade association newsletters, or the national trade press, include the articles or cite them in bullet form. This further establishes your expertise. If you haven’t written any articles, get started. Publications are looking for material. If you’re worried how well you write, ask someone to ghost write for you. I’ve ghost written for people. I know others have done it too. Publications want to hear from you by virtue of your position. You are the expert practitioner. Once I hired a guy who wrote regularly for the national trade press. The position required one to write well. I’d read this guy’s work, so I knew he could write. Uh, wrong. Simply stated, he couldn’t write. His editor could edit. He was the expert. He had the insight and knowledge, but he struggled to assemble it coherently. The trade magazine recognized the power of the message, delivered with credibility from someone who had done it, so the editor made it flow. If you’ve got good ideas (and I bet you do), an editor can make it work. So try it. Write an article and send it in. If you or an employee has spoken publicly on subject, cite it in bullet form. This ranges from presentations at national conferences to your local Rotary Club meeting. Every speaking opportunity is an inherent opportunity to promote your company. Take them when the come. Seek them when they do not. Don’t forget media appearances, such as radio or TV. Producers are much more apt to invite someone with media experience on a show than someone without any. They (correctly) figure you’re less apt to embarrass them if you’ve done it before. If anything’s been written about you, about your employees, or about your company, include the articles or cite them in bullet form. It’s a credibility builder. If nothing’s been written, try writing your own article. Even if it’s never been published, you can still format it like it was published. In one page, tell the media about your company. Lead with your unique selling proposition, which is a one sentence description of your company’s uniqueness. Outline the history of your company using bullet points. Who were the founders? How and why did it start? What was the legacy? What are the milestones in your company’s history? I have little doubt that the magazine benefited from corporate PR statistics. Twelve billion is hard to grasp. A pyramid 783 times the size of the Great Pyramid is big! It offers a point of reference. If you laid all of the pipe you’ve installed end to end, how far would it stretch or how high would it reach? How many football fields could be covered by all of the carpet you’ve cleaned? What is the cumulative value of the energy you’ve saved your customers through the years? Remember, if you save someone energy ten years ago, you continue to save that person energy ever year since. On a single sheet, state your company’s mission statement. If you lack a mission statement, consider writing one. It concisely defines what you will do and by exclusion, what you will not. It helps you stay focused. leading to a profitable exit strategy. Your company philosophy goes beyond your mission statement. It’s a philosophy. It speaks to how you conduct business. It’s a list of the core values of your company. It put you at a disadvantage in the marketplace? You operated in a wholly different industry with all new people? Your philosophy and values govern your believes and conduct related to your investors/owners, employees, customers, suppliers, and the public in general. They should define you. They should be timeless. State your philosophy and/or list your core values. Include a collection of employee profiles. Let the employee write the profile (with help, if necessary). The profile can include a photograph (and for key people, must include a photograph), education, work background, awards, accomplishments, and achievements, clubs, hobbies, and personal information. The profiles should build up your company by building up your employees. They also provide multiple touch points or points of connection. Touch points increase the chance a media person will find something in common with your company. If your company employs dozens, you might want to limit the profiles to key people. If your turnover is high, you might want to limit the profiles to key employees and those with a year or more of tenure. For broadcast media especially, provide the questions to ask and state the time required to answer each so the interviewer knows whether he should even pose a question when approaching a hard break. In almost all instances, you will be asked the exact questions you pose. If it seems you are doing the media’s job for them, you are. By doing it you accomplish three objectives. First, you will increase the odds you will be interviewed. Second, you will ensure you are asked the questions you want, where you’ve already thought out your answers. Third, you show that you are a professional, reducing the odds that you will embarrass the producer who schedules you. Provide a bullet point list of the products and services you offer. Think it through. Err on the side of specificity. Pool contractors should not assume that people will think they resurface pools. Air conditioning contractors should not assume people think they will provide heating. List all of the brands you sell. Depart from the bullet point list and simply include the logos with the brand names below them. Provide a list of customer testimonials, including the names and cities. Do not use initials, which look fabricated. Use the whole name. For your press kit, keep the testimonials short (you can always expand them on your website). Prioritize based on the strength of the testimonial or the fame of the provider. If you have testimonials from radio or television producers or hosts, include them. These reassure the producers of broadcast shows that you will not embarrass them, that you will be a quality guest. You gain media testimonials like any testimonials, by asking. After a media appearance, send the producer and hosts thank you notes. These are so rare they’re notable. As part of the thank you note, ask the producer/host for feedback on you as a guest. If you receive positive feedback, ask if you can quote their response. Last, but not least, include your full contact information. Let people know all of the ways to reach you and key people in your company.